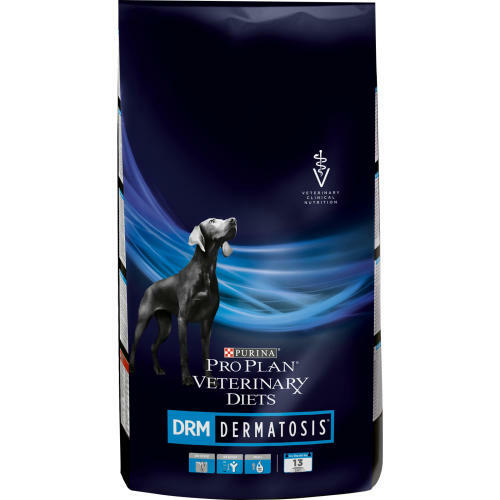 PURINA VETERINARY DIETS DRM is a delicious way to provide dermatologic management for dogs of all ages, whilst supplying complete nutrition. Tailored especially for dogs suffering with skin troubles, open wounds, adverse food reactions, or inflamed ear canals. Canine DRM is specially formulated with alternative sources of protein to minimise any food reactions and reduce itching. High levels of these proteins help to maintain and heal your pet’s skin as well as aid in the formation of collagen, essential for mending wounds. Canine DRM also has a high content of Omega-3 & 6 fatty acids, as well as increased amounts of antioxidants such as Vitamins A & E, providing vital support for your dog’s immune system. Most importantly, Canine DRM is mouth wateringly tasty to ensure the cooperation of your furry patient!